H4040 Knee-Length Deerskin Costume Trousers. 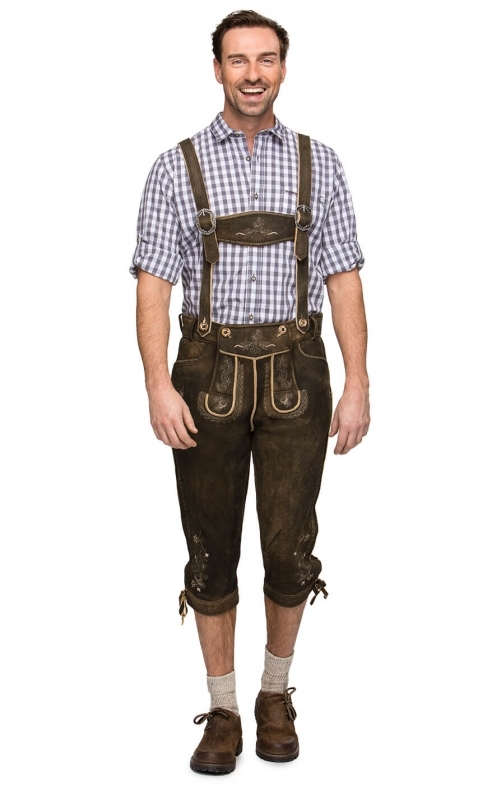 These traditional Lederhosen are made from soft, yet very durable deerskin and are designed to fall just below the knee. The medium brown of the leather is perfectly offset by the light coloured embroidery, which can be seen on the cuffs, waist and front of the trousers. The cuffs of each leg feature ties in leather that can be used to adjust the cuffs for the perfect fit. The waistband features both loops for a modern belt and buttons so that a pair of braces can be attached to the trousers if desired.